There must be a bit of a shortage of good crochet books. When I browse through Amazon to see if there's anything new and inspiring I get the same old titles. So when I saw this one on the 'My Rose Valley' blog I thought I'd give it a go. Yes it's in Dutch and no I don't speak Dutch. 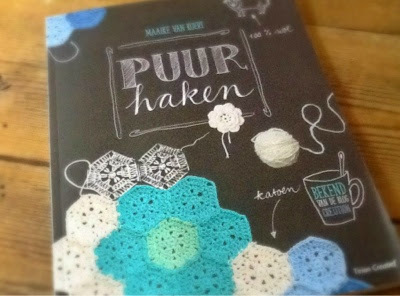 I do know someone who speaks fluent Dutch though, but in the meantime my ability to read crochet charts or diagrams is improving all the time. The charts in this book have handy row one and row two etc markers which the Italian ones didn't. It is a very dark and overcast day here in Lincolnshire so the photo's are a bit rubbish. 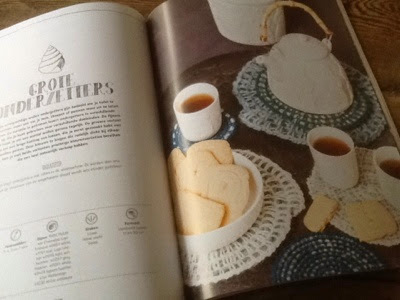 I have my eye on those place mats which would look rather good in our rustic kitchen. (It's so rustic we still have bare plaster on two walls!) 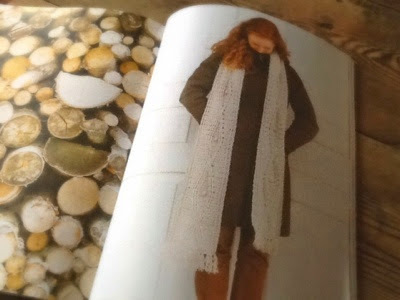 I like the aran style scarf which uses front post trebles but not in a way I've tried yet (diagonally?). The egg cosies are on the to do list too since we've been getting through trays of 36 from the farm up the road. Why, my sixteen year old daughter has finally learnt how to boil on egg! Despite that though she still only has them for breakfast if M happens to be home and offers. Lazy. There are several projects that look simple but effective. 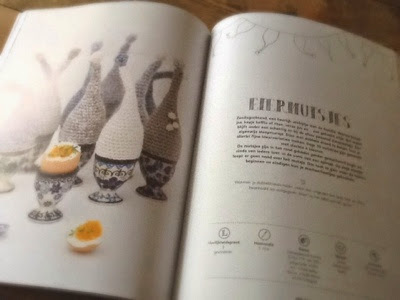 This is a book I would have loved when I was just starting out in crochet. I could have tackled the simpler projects but still had some for when I'd learnt how to do front and back post trebles, join as you go, puff stitches and bobble stitches etc. There's a simple floor rug using t shirt type yarn with a simple bobble stitch. I need to spend a weekend cutting up Jake's old t shirts. The last time I sorted out his chest of drawers was last year when he was 12, I came across a whole load of age 9-10 t shirts which he'd grown out of when he was about 7. He hates to part with things, I think he's going to end up like those hoarders you see on tv! Progress on Paul is still happening. 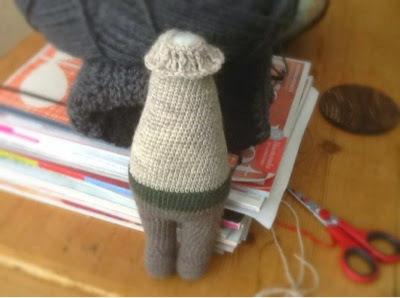 The neck and the beginning of the head was a bit of a nightmare. The pattern writer says she wrote the pattern for beginners. Nooooo way! You'd have to be a darn good beginner to get through this.